Annette Garcia sits with her two children in the main office of Walton School, in Cleveland’s Clark-Fulton neighborhood. It’s January, and she shivers from the frigid weather outside — so different from her native Puerto Rico. She’s been in Cleveland for only a few weeks, having come to stay with her sister after losing her home and most of her belongings in Hurricane Maria, one of the most damaging storms in Caribbean history. Now, surrounded by signs and posters in English and a room bustling with friendly-seeming but unfamiliar people, she feels uneasy and alone. The office door opens, and in walks a mustachioed young man with a pencil tucked behind his ear. He smiles, tells Garcia in Spanish that his name is Ismael Lara. He makes a self-deprecating joke about how much shorter he is than Garcia’s 14-year-old son, then hands each of her two children a new backpack. The family follows Lara to his desk, where they talk in broad terms about the family’s needs. He asks about their housing situation, whether they need clothing and food. It’s not what Garcia expected. This is school, after all: a place of books and classrooms and teachers. Yet here she is, talking about her life to a man she’s just met, a man who listens and takes notes and genuinely seems to care. Garcia says she feels reassurance — even a tentative sense of calm — for the first time since the hurricane. Community wraparound is an evidence-based strategy that blurs traditional boundaries between schools, families, and communities. While the overarching goal is to give every child the best possible education, wraparound acknowledges that this can only happen when kids are surrounded by families and neighbors that are on strong footing themselves. Schools must therefore serve not just to educate children, but as resource centers for entire neighborhoods. In Cleveland, many of the barriers to effective education have their roots in poverty. Cleveland has the highest childhood poverty rate in Ohio, and the second-highest childhood poverty rate in the nation. When families and neighbors struggle to afford food, clothing, and housing; when they lack well-paying jobs; when they struggle with physical and mental health issues — those problems can keep students from attending class, let alone graduating high school, going on to college, and finding a well-paying job. “If we think about what it takes for our kids to have access to the same education that [others] have, it means disrupting the really persistent issues that come with poverty,” says Eric Gordon, CEO of the Cleveland Metropolitan School District (CMSD). In some cases, families’ needs are acute and crisis-driven, as in the case of Annette Garcia. In others, services are of a more day-to-day variety. For example, students receive ongoing tutoring if they need it. Work training programs and job fairs give parents and community members access to new economic opportunity. Weekly food markets provide on-site access to fresh produce and healthy recipes. This interactive webpage presents an honest, midstream accounting of how wraparound works, how it has evolved, and recommendations from staff and partners about how it could improve. Along the way, families share stories of how wraparound has affected them — in ways both large and small. Like wraparound itself, this page is driven both by data and by the stories of real people. It’s designed to be useful and illuminating not only to educators in Cleveland and across the U.S., but to anyone interested in how urban schools work and how they are striving — alongside systemic obstacles — to provide a better future for the students who attend them. How the Wraparound Strategy meets the needs of students, families, and communities in Cleveland. Low attendance rates, with more than 18,000 of CMSD’s almost 40,000 students, or 45 percent, chronically absent. Of course, these challenges were not the fault of children or families themselves. Instead, they stemmed from governmental and institutional policies that isolated some Cleveland families — particularly African-American families — in neighborhoods that were vibrant and supportive in many ways, but that also struggle with high concentrations of poverty and disinvestment. The Cleveland Plan, enabled by state legislation in 2012, is a comprehensive strategy to address these challenges while ensuring that every child in Cleveland receives a high-quality education. Community wraparound was one of the reforms prioritized by the Cleveland Plan. CMSD introduced Community Wraparound to 17 schools in 2013 and by 2015 added eight more for a total of 25 schools out of 106. Between 2007 and 2017, 67 communities implemented Community Wraparound increasingthe national number from 33 to 100. Wraparound programs were already in place in Cleveland on a limited scale, but the Cleveland Plan allowed them to expand both in scope and number. For the 2013–14 school year, CMSD implemented community wraparound in 17 schools, and added eight more for 2014–15. The 25 community wraparound schools represent about a quarter of the 106 public schools in the district. Cleveland is far from the only city to adopt a wraparound strategy. 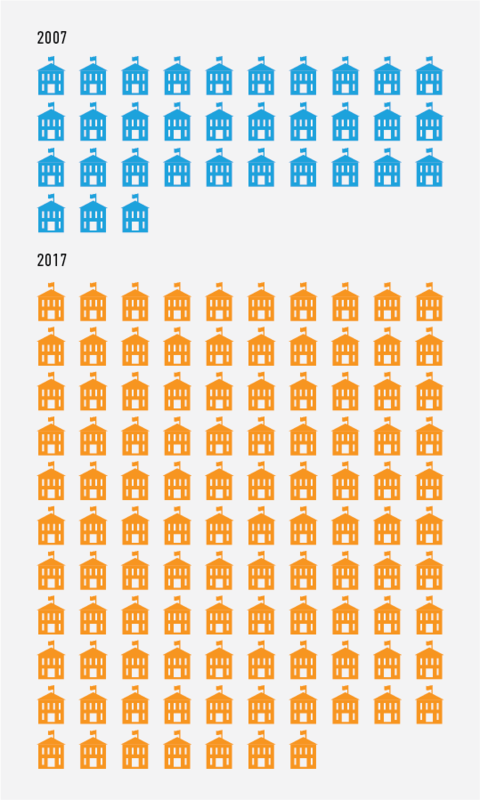 In 2017, about 100 communities in the U.S. operated wraparound programs, up from 33 in 2007. This growth has been due largely to a growing body of research showing that the wraparound model is effective at removing barriers to academic success. For example, wraparound schools show consistently higher attendance rates than similar schools without wraparound programs. They also have lower rates of chronic absenteeism. a full range of health, mental health, and social services. The Center worked with CMSD and its partners to adapt the wraparound model to the specific needs of Cleveland. Wraparound places students, families, and community members at the center of a network of support. “Wrapping around” them are professionals and organizations who help meet their needs, whether academic, social, or emotional. There are no “bright lines” defining who provides what type of support. But one of the strengths of the wraparound model is that it allows principals and teachers to do what they do best — educate — while other trained professionals focus on the community’s non-academic needs. One of the features that makes the Cleveland program unique is that it’s not managed by the school district alone. Instead, CMSD co-leads the wraparound strategy with United Way of Greater Cleveland, the largest private-sector funder of health and human services in the region. United Way is a critical partner because it raises and allocates funds for, and offers strategic guidance to, a range of charitable organizations throughout Greater Cleveland. As such, it can convene and empower organizations to address the complex problems facing Cleveland schools. For the first year of the program, 2013–14 school year, CMSD and United way each committed $500,000 to the initiative. The Jewish Federation of Cleveland, the Cleveland Browns Foundation and the Saint Luke’s Foundation were early supporters of the strategy. Lead agencies are nonprofit organizations who operate under CMSD and United Way to operate wraparound programs at the school level. They are selected by schools themselves because schools best understand the needs of their students and communities. At present, 16 lead agencies serve 25 schools. They range from social service agencies to arts organizations to neighborhood development corporations. Importantly, schools choose the lead agencies with which they will work, to allow school leaders to feel “incredible buy-in from the beginning” with the wraparound model, in the words of CMSD’s Eric Gordon. Lead agencies help establish schools as hubs for community resources. “Our role is to bring community resources to schools to help kids and their families,” as one lead agency director put it. By bringing services to schools, lead agencies offer “the convenience of bringing assets to a centralized location where a parent or family is connected most,” in the words of another. Lead agencies not only offer in-school services themselves, but also invite other agencies to provide a range of services they cannot. For example, a lead agency that is an arts organization may invite other agencies to provide in-school math tutoring or computer programming classes; in-school dental clinics; or job training programs for adults. The services offered are always based on the needs of the students, the community, and aligned with the goals of the school. That’s why, while some lead agencies serve multiple schools, no two wraparound schools look exactly alike. For each school they serve, lead agencies receive a grant, which pays for the site coordinator’s salary and provides a budget for events, food, and other supplies. In addition to services specific to individual schools, all wraparound schools must provide academic tutoring. They must also offer services that extend to times when school is not in session. For each of its partner schools, the lead agency hires a site coordinator — a full-time, on-site staff member who works directly to assist students, families, and community members with whatever they need. “In the most creative way possible, we eliminate barriers to success,” is how one site coordinator put it. “I’m a gap filler,” said another. Site coordinators are partners, not tenants, of schools. They report both to their lead agency and the principal of their school. They meet regularly with principals to monitor progress and discuss new program ideas, with principals making final decisions about programs and services that are implemented. It started with a father who was facing deportation. I helped his family find pro bono immigration lawyers. Then I talked to a family who’s struggling with homelessness, and connected them to a place where they might find temporary housing. I set up a care closet that contains toothbrushes for kids who don’t have them and snacks if they’re hungry. Site coordinators operate school-wide initiatives and plan large community-wide events. But because everyone’s needs are different, the heart of their work is one-on-one interaction — with students, families, and community members. These interactions are both deliberate and spontaneous. While student contact often occurs in site coordinators’ offices, it can also happen in hallways or classrooms. Conversations often touch on deeply personal issues such as family, relationship, or financial difficulties — underlining the need for site coordinators to be able to handle a wide variety of both academic and emotional challenges. Brian Webster has become a talented reader of faces. As site coordinator for Anton Grdina Elementary School in the Kinsman neighborhood, he sees hundreds of students and parents every day. Like anyone else, they have good days and bad, the emotional residue of which show up in their expressions and general demeanors: purposeful strides on good days, slumped shoulders and tired eyes on bad. But one parent, a mother of two in her early 20s, kept catching his eye. She never smiled. Not even once. “She came around a lot, dropping off her kids or picking them up, and I could tell she was unhappy,” Webster says. Experience told him not to ask her directly what was wrong — at least not right away. He knew such questioning could be viewed as intrusive. Instead, he simply made sure to be around a lot when she came by, in case she ever wanted to talk. He also gave her two sons plenty of attention. He praised them for consistent attendance, joined them for lunches in the cafeteria, made sure they had access to tutoring when they needed it. After a few months, the mother finally approached him. She introduced herself as Dianna Hogue, and told him she lived at the public housing estate nearby. After a few more casual interactions, she began to confide in Webster — including that she’d recently lost her mother to cancer. At 23, Hogue felt alone in the world, bereft of the support from the woman she considered her closest friend and ally. She continues to struggle emotionally, but her guarded veneer has lifted. She credits not just Webster but the school’s whole staff. Hogue’s trust in Webster and the school bore even greater fruit later that year, when Hogue’s apartment was destroyed in a building-wide fire. Webster visited her on the day it happened, and helped connect her with agencies that provided donated clothing, furniture, and toiletries. After a fire destroyed the homes of several students and their families, a Wraparound Site Coordinator stepped up to provide comfort and support. Measuring the impact of the wraparound program is a complex task. It is tempting to gauge success solely or primarily on academic outcomes for students. However, while improved academics are certainly an overarching goal, other measures provide more informative short-term barometers of success. “We know though from decades of research that you don’t get to better graduation rates and higher test scores if you don’t first tackle some of what we call the leading indicators,” says Eric Gordon of CMSD. Cleveland’s wraparound strategy has four main goals, with specific data measurements attached (see below). Overall, since the wraparound program began in 2013, schools have seen substantial improvement across these measures. Just as importantly, the gap between wraparound and non-wraparound schools has narrowed significantly. This means that students in wraparound schools are less likely to fall behind their peers in academic achievement. Students cannot learn if they are not present in class. Therefore, one of the wraparound strategy’s central focuses is to make sure students and families have what they need to make the daily trip to school. This could mean providing warm clothing to children or helping families remove other barriers such as transportation or child care. Since the current wraparound strategy began, student attendance in wraparound schools has risen, particularly at the high school level. Among wraparound high schools, daily attendance increased to 92.3 percent in 2018, compared with 81 percent in 2013. The attendance rate at K–8 schools, meanwhile, improved slightly — to 90.4 percent in 2018, compared with 90 percent in 2013. Also indicative of students’ presence and ability to learn are decreases in chronic absenteeism, or the proportion of students missing 10 or more days per school year. Again, wraparound high schools posted a dramatic improvement in this area, with absenteeism falling to 26.1 percent in 2018 from 62.4 percent in 2013. Wraparound K–8 schools saw a more modest improvement over the same time period, to 35.7 percent from 37.2 percent. 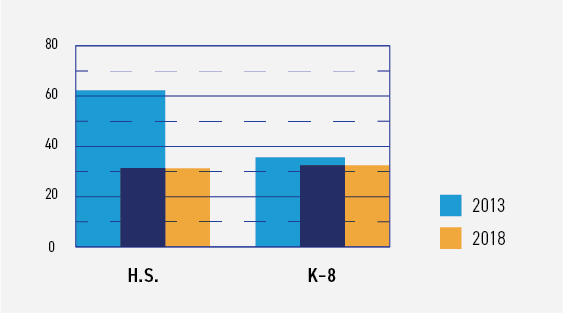 While attendance in K–8 schools increased slightly, the most significant increase is shown with high school students, jumping from 81% to 92.3%. Chronic absenteeism significantly dropped at high schools with the Wraparound program from 62.4% down to 26.1%. At K–8 schools, absenteeism decreased from 37.2% to 35.7%. Family and community engagement are also priorities of the wraparound strategy. Without the support and presence of their families and communities, students are unlikely to perform to the best of their academic abilities. Family and community engagement is measured in two ways. The first is the number of school-hosted family and community programs (such as food markets and activities linked to student learning); the second is the number of participants who attended those programs. On both measures, wraparound schools have seen dramatic increases since the strategy began. The number of events rose to more than 600 in 2017–18, from just 37 in 2012–13 before wraparound began. Meanwhile, the number of participants in those events rose to nearly 24,000, an 18-fold increase since 2012–13. The number of events and the attendance of events by families since 2012 has been a dramatic increase. Event opportunities jumped from 37 to more than 600 and participants jumped 18-fold to 24,000. The community wraparound strategy has started to produce promising academic results. Among the indicators where wraparound students are showing academic progress are the Third Grade Reading Guarantee, K-3 Literacy, and the high school graduation rate. At the K–8 level, Ohio’s Third Grade Reading Guarantee is a program to identify students from kindergarten through grade 3 who are behind in reading. The past five years have shown improvement in the number of wraparound third graders passing the test and moving to 4th grade. Schools showing impressive numbers include Kenneth Clement Boys’ Leadership Academy, with 100 percent of 3rd graders passing the test two years in a row (2016–17 and 2017–18); Fullerton School of Academics, showing a 47 percent increase in the number of students passing the test since 2013; and Michael R. White Elementary School, with a 19 percent increase since 2013. K–3 Literacy looks at whether schools are successfully helping students move to reading proficiency in 3rd grade and beyond. Many wraparound schools saw improvements in K–3 literacy over the past five years. Schools showing impressive gains in this area include Fullerton School of Academics (15.7 percent gain in on-track students), Luis Muñoz Marin School (13.3 percent gain) and Mound STEM (10.6 percent gain). Adlai Stevenson School moved from a D to a C and Kenneth Clement Boys’ Leadership Academy moved from a C to B in K–3 literacy on the 2017–18 state report card. Students who graduate high school are not only more likely to attain financial security than their than peers who do not graduate, they are also more likely to avoid incarceration and poverty. In 2013, the graduation rate at wraparound schools was just 57 percent, compared with nearly 78 percent at non-wraparound schools. By 2017, the most recent year for which data are available, wraparound schools posted a graduation rate of 60 percent, compared with the non-wraparound rate of 79 percent. It is important to note, once again, the context of these changes: specifically, that wraparound schools started at dramatically lower graduation rates at the outset of the initiative and therefore had (and still have) a much greater gap to close. In addition to these quantitative measures, qualitative stories from individual students — such as those included in this report — in many ways paint the most vivid picture of the wraparound strategy’s impact. “Wraparound is definitely a strategy that makes things happen that wouldn’t ordinarily occur,” one principal said. Before wraparound, in the words of another, “we might have told parents to go find services, but now we have services come to the parent.” That often means the difference between a family receiving help and forgoing it due to lack of accessibility. By day, Jonathon Blackwell is a project manager at a local utility company. But once a week, during his lunch break, he becomes “Mr. John” — tutor extraordinaire. There’s no special uniform, no theme song, but to a first-grader named Noah at Case Elementary School, he might as well be a superhero. “Is Mr. Jon coming today?” he’ll ask his teachers. And if it’s Tuesday, the answer is always “yes.” Blackwell is one of a handful of tutors who comes to the school every single week. With the support of his boss, he even blocks off the time on his work calendar. “It says, ‘Do Not Schedule Any Meetings Around This Time,’” says the father of two with a laugh. Blackwell is one of a roster of volunteers from for-profit and nonprofit companies that visit Case to offer tutoring for kids during lunchtime. The goal is to help kids with their reading, but also to build positive intergenerational relationships — some of which last for years. That support, in turn, makes it more likely that the kids will want to come to school, Black says — and good attendance is a prerequisite of academic success. “Even students with attendance problems, we notice they show up more often because they know their tutor will be here,” she says. “Their friends might say, ‘Tutoring is stupid,’ and the kids are like, ‘No it’s not. I would never miss a session,’” Black says. At first, Case’s program emphasized group reading sessions, but has transitioned to mostly one-on-one work because kids seem to prefer that type of connection. They also learn to read more quickly that way, Black says. Allowing the program to evolve — even as its key feature of adults mentoring students remains constant — has been one of the keys to its success, Black says. In that way, it’s similar to most of the programs she helps oversee. At the same time, adaptations must be balanced against the importance of keeping consistent relationships. For Blackwell, his bond with Noah is both uplifting and “humbling” — and “not just because we sit with them in little kiddie-size chairs,” he jokes. One of the strengths of Cleveland’s wraparound strategy has been its ability to evolve — both overall and at the individual school level. The story of Case’s tutoring program, which has shifted to emphasize one-on-one tutoring over group sessions, is just one example. While wraparound is based on best practices supported by national research, Cleveland leaders understood from the start that the the city and its population are unique. Wraparound has therefore been a work in progress, continuously adapting to better fit the needs of students, families, and communities. Following are some lessons learned over the course of the program’s first five years, as identified by the principals, site coordinators, and lead agencies who oversee wraparound on a daily basis. If there’s a common theme across these lessons, it’s the importance of trust and consistency. In order for wraparound to achieve its goals effectively, trust must exist in all areas of the wraparound network of support — between families and schools, between students and site coordinators, between principals and lead agencies. Trust takes time to establish, and can be facilitated by consistency and continuity in staffing. 1. Families and community members need continuous reminders of what wraparound is and what it offers. Many family members and community members hold a traditional view of public education. Perhaps remembering their own childhoods, they think of schools only as places of “teachers, books, and classrooms.” These deeply held notions are difficult to change, and school leaders must commit to continuous outreach and communication to help adults understand that schools can help them, too. “Families struggle to understand that I have additional resources to offer” beyond what’s available at the school itself, said one site coordinator. To drive home this message, there is no substitute for face-to-face conversation. In their daily interactions with families and community members, staff must continuously convey the message that wraparound can help them with whatever they need, and is not meant to serve students only. Actions speak even louder than words. Several site coordinators reported that they were able to “break through” to parents only once they took highly individualized actions to address specific needs. One coordinator drove a parent to a furniture bank to find items for her apartment. Another introduced a parent to a domestic abuse program after hearing her speak about an abusive relationship. These actions speak to the need for wraparound to meet adults “where they are,” and to drive home the message that wraparound can help with problems that have nothing to do with academics. 2. While best practices exist, every school is different and requires a tailored approach. When it comes to addressing the needs of wraparound communities, the “rubber stamp” approach doesn’t work. Leaders must listen carefully and continuously to the needs of both students and adults in the community — and recognize that those needs will change over time. Meanwhile, on the “supply” side, “new programs and services are coming around all the time,” one site coordinator said. School leaders must remain aware of them so that they can reach out to those providers and offer their communities the ones that are most relevant. 3. The missions of lead agencies and community partners must align with the needs of schools — not vice versa. Many well-intentioned nonprofit and for-profit organizations approach wraparound schools to offer their services. While these services are invariably valuable in and of themselves, some do not match the needs of the students or the school community. “Everyone thinks they have the magic pill to help students, but it may not be what they actually need,” in the words of one site coordinator. For example, an after-school literacy program may not be needed in a school where reading scores are high or where the school already offers its own literacy assistance program. Sports and physical activity programs may be redundant in schools with strong athletics. To keep these offers from becoming overwhelming, and to clarify whether or not particular services are needed, school leaders should be proactive in defining the community’s needs. “We need to make sure we’re streamlining around what the school mission and vision is, and that we’re clear on what is not going to have a positive impact,” in the words of one principal. 4. Trust is the most important ingredient to developing life-changing relationships, and trust takes time to build. The most productive relationships between site coordinators, families, and students are those that develop over time — most often over multiple years. “You can’t help someone if they won’t share what their issues really are, and they have to have trust before they’ll share,” in the words of one lead agency director. This level of trust takes time, and is possible when site coordinators, families, and students all remain in place for the long-term. Priority must be given to promoting stability on all fronts: keeping site coordinators happy in their jobs, helping families maintain stable housing, and promoting consistent attendance among students. Wraparound participants at several levels reported that trust could be improved significantly by creating greater year-to-year certainty about funding and other details. Site coordinators reported feeling anxious each school year about whether their contracts would be renewed for next. “Kids ask me, ‘You’re going to be here next year, right?’ And I have to say, ‘I don’t know,’” said one site coordinator. That creates job insecurity for coordinators, but also “does a disservice to families and students” looking to build relationships. One principal reported that his school had been through four or five site coordinators in nearly as many years. 5. For families, convenience is key. “We can’t overstate the importance of accessibility of resources to families,” one lead agency director said. “For [people] not to have to catch a bus or spend an extra dollar is really important.” Offering services to students and families at times and locations that are convenient to them is therefore critical. By contrast, outside referrals that require a trip downtown, for example, are more likely to go unacted upon due to lack of time, transportation, or energy. Often, the most convenient location for offering services is the school building itself, because it’s the one place where many students and families come every day. A successful wraparound program is built on “the convenience of bringing assets to a centralized location — the school — where you know parent or family is connected the most,” in the words of another lead agency director. This could occur on an even wider scale than it currently does. Several site coordinators expressed a wish for bilingual services and housing assistance services in every building, for example. Greater centralization of information about services available would also be a great benefit, helping site coordinators connect community members to resources more quickly, one site coordinator said. 6. Principals, lead agencies, and site coordinators work best together when they understand and respect each other’s strengths. Given the complexity of wraparound work, overlaps in duties between principals, lead agencies, and site coordinators will inevitably occur. However, site coordinators and principals report that they work at their highest capacity when every staff person is empowered to perform the tasks for which they are best qualified. Five years after the community wraparound strategy started, the program stands on the precipice of continued expansion and change. The strategy’s successes and lessons learned to date give the program a solid foundation on which to build, so that everyone continues to benefit as much as possible. The program must also continue its strong track record of evolving to better serve children. Perhaps the greatest potential area for improvement as identified by participants is to develop more consistency and continuity in staffing for both principals and site coordinators. Long-term relationships build trust, and trust is in turn the gateway for students, parents, and community members to ask for and receive the services they need to thrive. On an academic level, a stronger focus on literacy between kindergarten and third grade is needed to help wraparound students close the gap with their peers. Whatever happens in the future, the entire community must keep in mind that for Cleveland and its people, the stakes could not be higher. Every child deserves a high-quality education, which now more than ever is the primary indicator of future success, stability, and happiness. The wraparound strategy is a means for ensuring they receive it.